Plenty of good stuff about the film "To Catch A Thief", owning an apartment in the south of France, food, travel, stories, and more…. To Catch A Thief: Locations, locations, locations…. Check out Le Stuff’s new “To Catch A Thief” page. I was contacted recently by a film producer who’s developing a series of travel shows for Germany’s N-TV. He asked for my help in identifying specific locations used in To Catch A Thief. Well, I thought it would be a breeze but I have to admit there were a couple of challenges. A woman screams as she discovers her jewelry has been stolen. 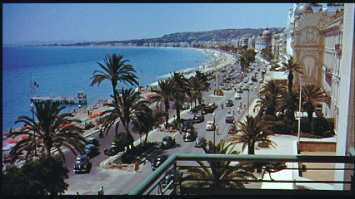 In a panic she runs onto her hotel room balcony where we, the viewers, are treated to an expansive shot of Nice’s world famous seafront boulevard, the Promenade des Anglais. And so begins Alfred Hitchcock’s light hearted thriller “To Catch A Thief”. The producer wanted to shoot on the “actual” balcony used in the scene. I knew it was several blocks east of the Hotel Negresco (the pink dome of The Negresco can be seen in the background) on Nice’s Promenade des Anglais, but I had never taken the time to pinpoint it exactly. It wasn’t possible, when pausing the scene, to count the number of blocks from the Negresco so I needed to find a closer landmark in order to “count down” to the exact spot. That landmark ended up being the distinctive roof line of what is now the Hotel Palais de la Mediterranee. Once the Palais was located it took just a few minutes to arrive at the correct balcony. It’s located on the corner of Rue Massenet and the Promenade des Anglais, just behind the Club Mississippi and office of tourism (05 Promenade des Anglais, 06000 Nice, France for Google Earth fans). For some reason, I had not previously tried to find the picnic setting, even though it’s one of the film’s best-known scenes. For this challenge I simply had to pull out a map and go to work. The spot (overlooking Monaco) that Hitchcock used is widely believed to be the same road on which Grace Kelly was killed in a tragic car accident in 1982. It’s not (she crashed while driving on the CD37 below the village of La Turbie). I’ll reveal the location of the picnic in a future post, but in the meantime you might like to know what I found on the spot made so famous by Cary Grant and Grace Kelly. The picnic scene is featured at 0:24 in the trailer (below). Great post. Is there anyone who knows as much about the movie and shooting locations as you? As a lover of “To Catch a Thief” I’ve searched all over the internet for film information and this is by far the best site I’ve found for filming location specifics. Thanks for sharing the info with all of us movie fans. I’m eager to see your next post. I´m waiting for your confirmation on the picnic location. I believed I found it using Google Earth some time ago. I can’t believe I have found this blog so late. I am a huge fan of the film and I would be too curious to get the confirmation of the picnic location, too :-) Since I am from Germany I will have a closer look at n-tv’s programming schedule when they will air this special. Do you have any information about that? Or was it aired and I missed it (no!). Thanks – great blog! i send you comments about pic nic area that i send to alain kerznoncuf and nandor bokor, author of a very good work about..
Merci beaucoup pour votre très aimable mail. Votre français est tout à fait OK. He may very well be right! Internet is a wonderful thing, don’t you think? Donc merci encore de votre aide. le link est aussi sure le Recent Changes on http://www.hitchcockwiki.com. a mon nom LUCAP. la camera peut etre etait mise sur le rocher a gauche du nouveau batiment ” atelier mecanique ” . la vue sur le port de Monaco , a mon avis, c’ est la meme du film. merci pour votre opinion . I’d like to know where the steps that Cary Grant walks down to Bertani’s restaurant early in the film are in relation to the rest of the city. I also wonder if Bertani’s restaurant ever existed or if it was set up for the film. i will send you a picture of the exact place as soon as possible. Excellent job Marco! Always nice to hear from another TCAT detective. One more location…watching the film, the man with the wooden leg who was thrown into the sea. The wall he is thrown from, I am 90% sure, is at the Plage de Passable on Cap Ferat, with Villefranche in the background. Apologies if you already had this info. Ha! You got it Antony! Well done. I stumbled upon that one by accident years ago. Hope you’re having a great time on your honeymoon! Great find! I myself still wonder about the actual location of Robie’s Villa when researching via Google Maps (or other services like Bing). Is it located on Route de Saint-Jeannet? Unfortunately there is no Google Street View available to actually see the gate area. From above the entrance to the property I have in mind and think is the villa looks good in terms of the bushes around it and the location righ before a curve on the route – but I am not certain since the roof looks so different comparing with screenshots. But as said – I am just not sure it really is. Can you confirm or correct? Thanks! the actual location of the robie’s villa is: – 335 route de s.jannet – as you can see from the work of alain and nandor ( page 5 ) and the google map.. as you said. Hi Luca, so nice to hear from you again! I’m very excited to hear what you’ve discovered about Bertani’s restaurant!!!! Thanks so much for all your help and I hope you’re doing very well. Hi there Marco! Nice to hear from you. Luca has correctly identified the villa location in his response to your comment. I posted about it back in 2009 here – http://lestuffblog.com/2009/08/16/to-catch-a-thief-take-2/. For some reason I didn’t give the address, so thanks Luca! Thanks for checking in Marco. Yeah – then I got it right! The “D18” was confusing me since the street was not labelled like this in any of the map services on the net (like google maps or Bing) but just “Route de Saint Jeannet”. Thanks again, all! Like Le Stuff on FaceBook! Top Gear In The South Of France: The World's Best Driving Road?